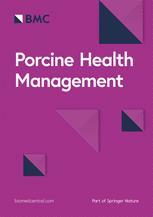 Uniquely focussed on advancing porcine research to serve the veterinary community, Porcine Health Management publishes on all aspects of swine health medicine and production. As the official journal of the European Association for Porcine Health Management (EAPHM) and European College for Porcine Health Management (ECPHM), and edited by our expert board, the journal provides rapid dissemination of your high quality, novel research. All articles are made fully available through PubMed, PubMed Central and more indexed databases.